Find out more about our six operating groups and various subsidiary companies. Learn about the background and business philosophy that drive our companies. We make it a point to try to give back to each community in which we do business. Group One is a holding company branched into six different operating groups, with a diverse array of affiliated companies employing hundreds throughout the United States. The company has grown from a single $600 per week contract to revenues in excess of $45 million. Despite its momentous growth, Group One has never lost sight of its founding goals and values. Paramount to the success of every venture is Group One’s “Commitment to Excellence.” This core operating credo states that Group One will provide every customer with superior services and efficient technologies in a safe and dependable manner. We pride ourselves on holding to the highest standards. 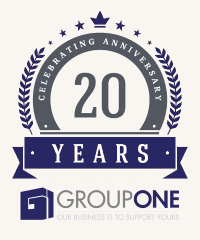 Group One is not simply a holding company, but rather a family of businesses united by its values and vision. Group One includes businesses that operate in facility maintenance and construction; airport ground support services; security solutions and monitoring; information technology consulting and managed hosting; cyber-security; web-based marketing and web design; signs and advertising; parking and busing services; warehousing and logistics; real estate and auto leasing; and business consulting. Despite the vast array of industries Group One operates within, its focus remains singular: on establishing companies that provide the best value and most innovative solutions, no matter what the service.